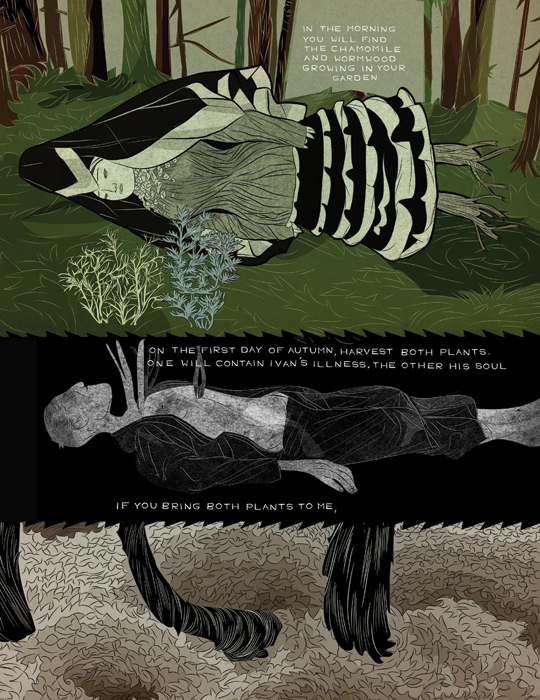 Tin Can Forest, according to this lavish near-tabloid size comic’s indicia page, is Marek Colek (story and images), and Pat Shewchuk (decorative elements/plant images/symbols). That’s hardly your typical writer-penciler comic booky division of labor, and as per usual when formulas are deviated from, you can read artistic intent in what’s being done differently. “Story and images”, which are typically the comic in toto, share credit with the kind of job that’s usually relegated to the fine print as “design coordinator” or some such unglamorous functionary title. In this comic, though, that extra stuff is important, just as much a part of the reading experience as the words and pictures. It’s a statement of purpose that’s carried out in deeply satisfying fashion — this comic leaves it all on the page in a stunning effort to be a beautiful object, and it hits right on the mark. Colek’s fluid, sensuous linework and moody, fog-drenched colors put forth a moody, engrossing canvas for Shewchuk’s vaguely Art Nouveau design motifs to spiral out from the word balloons, superimposing an extra layer of visual decadence on top of the “comic” part of the comic. 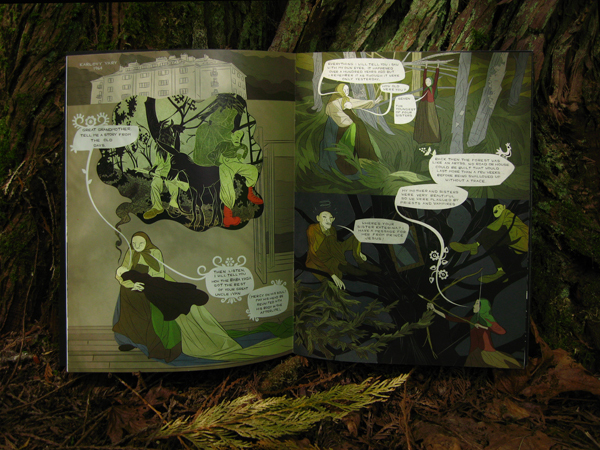 As a pure visual experience, it’s dizzying, so lush and elegant that the eye lingers over every inch of every page in this vague, atmospheric folktale adaptation. 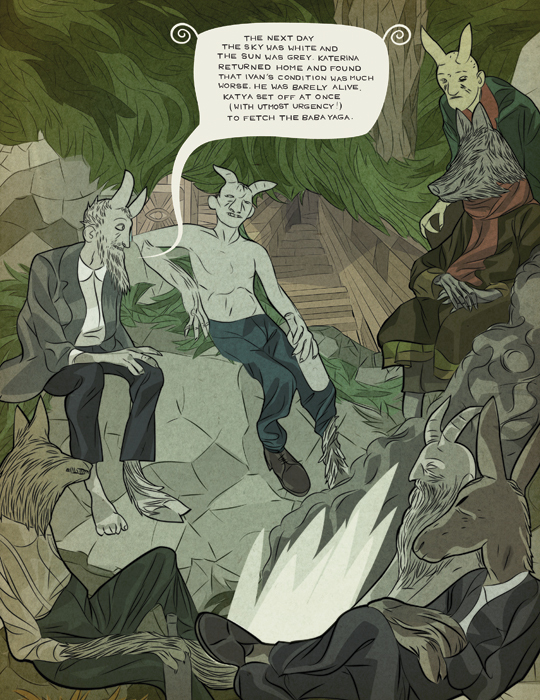 The crisp, dry grays of dead leaves curling over forest floors invite as much contemplation as Colek’s graceful, bigfoot-inflected cartoon figures, which draw together the liminal, breathier qualities of James Jean, Mike Mignola, and Rafael Grampa into a thin-lined solidity that’s never forceful but never lets up either. And though the move through the pictures is slow and scenic, it’s always in process, rarely abutted even by panel borders. 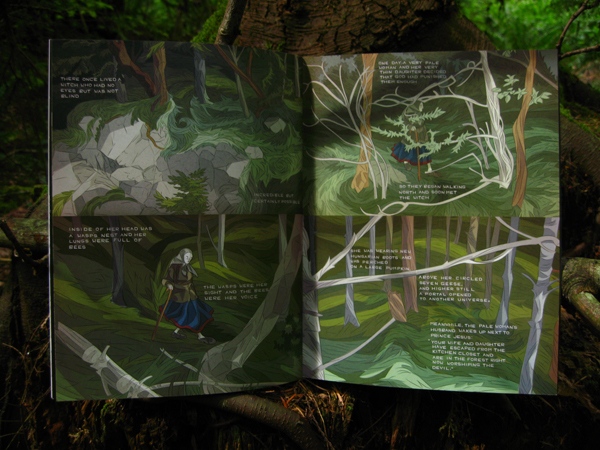 Baba Yaga’s pages are so roomy, so full up with their thick and verdant natural backdrops, that the figures simply wend their ways across them, multiple images of the same people leading the story from one place to another in a slow, almost processional rhythm. It’s an approach that finds a good mirror in the specifics of the plot, which is as simple as it is imagistic; a desperate Russian peasant makes a deal with the devil in exchange for his brother’s life, and can turn only to the witch Baba Yaga for salvation when it inevitably goes bad. There’s at least as much nuance as substance to this material, and Colek and Shewchuk seems at least as interested in exploiting its pictorial potential as they are in bringing it to a satisfying conclusion. 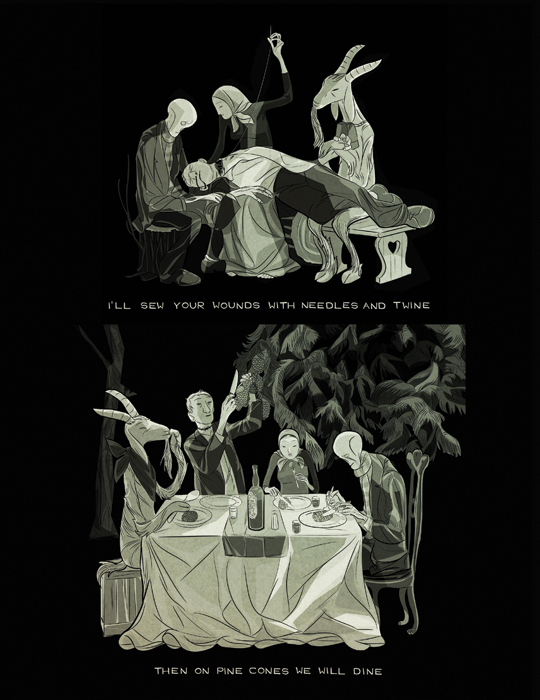 In fact, the comic cuts off on a haunting, evocative note, its plot laid out but completely unresolved. It’s a testament to the hypnotic quality of the duo’s wide-open use of the medium, as well as the power of their work’s emphasis on total visual pleasure, that the truncated ending isn’t in the least unsatisfying. Rather, it takes the reader as deep as can be into an almost completely unrecognizable world of supernatural forces and thick color and curiously absent morals, and leaves off in the center of it instead of leading us back out again. This is “art-first” comics done with considerable talent and clarity of vision, the story growing more obscure as it goes, breaking down into blackness and hymnal song lyrics, its word balloons’ tails pointing to the characters who are most prominent in the compositions rather than the ones who are actually speaking, but simple and boldly stated enough so that it’s never lost in Colek and Shewchuk’s near-tangible image-thickets. Arresting, compulsively readable stuff that makes a grand showing of the medium’s potential for suggestion over depiction. “This is a story told to me by my great grandmother. She lived in a time when the wilderness was everywhere, vampires roamed the treetops, and devils traded opium and vodka for human souls by the roadside. 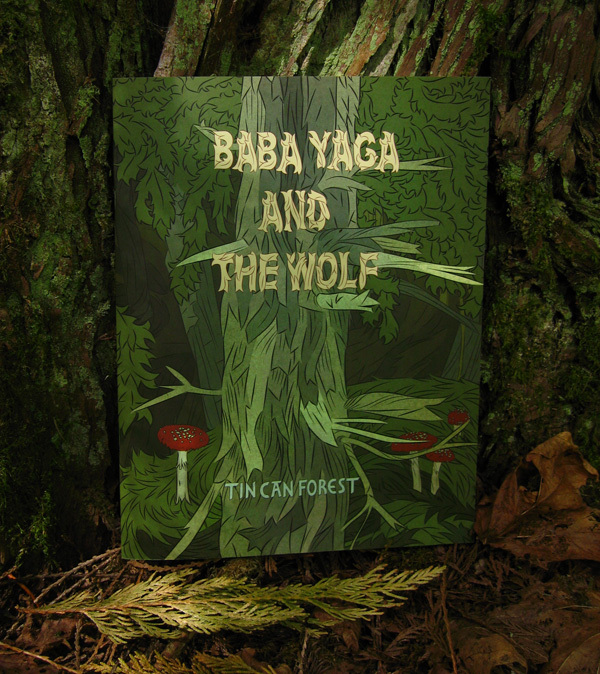 Visually influenced by the dense forested landscape of British Columbia, Baba Yaga and the Wolf tells the story of Katerina and the journey she takes to the edge of the Underworld and its gatekeeper, Baba Yaga, in order to save her husband Ivan from a terrible fate. A deity whose beginnings are twisted and tangled in the origins of Slavic folklore, Baba Yaga has been interpreted as many things: as a patron goddess of the land and those who toil upon it; a benevolent guide, spinning tales of life from the flesh and bone of the dead; and as a guardian of the Underworld, a sentinel tasked with keeping the souls of the dead from being redistributed to the newborns of the living world—unless she desires it to be so. 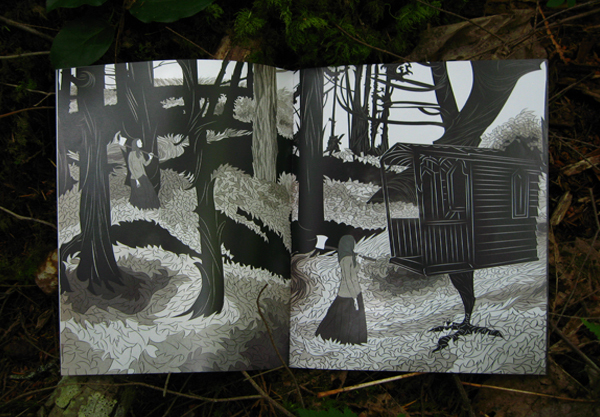 Hidden in a cottage that sits upon hen’s legs, buried in the deepest corner of a dark and inhospitable forest, Baba Yaga can at once be a saviour to those who seek her out, or a manipulator, tricking unknowing souls into giving that which is most precious, most prized. In Baba Yaga and the Wolf, Marek Colek and Pat Shewchuk, drawing inspiration from early Russian animated films, Slavic mythology, and symbols and pictography associated with the many iterations of the Baba Yaga mythos, have given new breath to an age-old cautionary tale of being careful to voice that which one most desires in a world where every leaf on every branch on every tree might be aware of such wants and the darkness that exists at their root.